Kindergarten helps children learn to communicate, play, and interact with others appropriately! The Kindergarten Program at Stepping Stones Child Care Co-operative is available at all three of our locations in the Regina area! 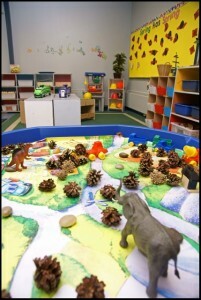 Kindergarten at Stepping Stones Child Care helps your child learn–and still be a kid! We are conveniently open Monday to Friday 6:30 am to 6:00 pm at our Robinson Street Location, and 7:00 am to 6:00 pm at our Broad Street location. For flexibility and extended hours, we are open 5:30 am to Midnight Monday to Sunday/ 7 days a week, at our Elphinstone Street location. Stepping Stones Child Care Co-operative keeps our teacher to student ratio low, which helps your child learn more with individualized attention! We have 1 staff for every 10 children. Children in our kindergarten program attend school for 1/2 days and attend daycare for the rest of the day or attend kindergarten full school days, alternate days and daycare before and after school on school days and full days on nonschool days. Children from our Elphinstone location are bused to the following schools: Sacred Heart (Separate/English), Wascana (Public/English), Ecole Elsie Mironuck (Public/French), and St. Mary (Separate/French). Children from our Broad location are bused to Ecole Elsie Mironuck (Public/French), St. Mary (Separate/French) and we walk children to Imperial School (Public/English) and St. Michael (Separate/English). Children must be baptized to be enrolled in a Separate/Catholic school. For more detailed information about transportation for public schools, please Click Here, and for Catholic schools, please Click Here.